Where we are: East Africa, Northern Uganda, just miles from South Sudan and Congo is a village of about 23,000 people and over 95% Muslim, most living with AIDS and now many refugees. These are the Aringa people crying out to God and surviving by the soil they live on. They speak the Lugbara language and live in Grass thatch homes called tukuls. Everyday is an adventure. Pastor Vincent is a native to these lands married to an American, Melissa. They have 2 boys and 13 Ugandan children. The name Aniku literally translates: I Don’t Know! Our Children: We have been blessed with 13 (adopted) children. Each was rescued from poverty and pain. These precious children now have a future and hope in Christ Jesus. (Jeremiah 29:11) They go to school and know God through His provision and His love for them. Our Vision: To open job opportunities for the community so we can become self sustained. To begin sharing our vision we will explain the current situation. There are Muslim leaders who come to our home and say they are Christians but cannot profess openly because their 5 or so wives and 20+ children will be chased away. There are members in the church as well who have neither jobs nor opportunities to provide for their children. A long-term vision is to disciple and plant more self sustained churches through a mini Bible College. We own 3 areas of land, each with a unique vision. 1. Football/Soccer Hall- This is an area of business, job opportunities and spreading the gospel through movies and sports. A match can find as many as 600-700 people in the hall. We are also hoping to open a restaurant and other small businesses that our youth can take over as they finish their trade schools and higher education. 2. Land in Bush- This large, untouched land has opportunity for large scale farming, job opportunities, safe place for converts to live, raise cattle, plant pine trees for future church plants and space for a future Bible College. 3. Land we live on- this is residential land where we live with our children. The girls have their own tukul, boys their own room, each child has their own beds. As the Lord provides, we will build more small rooms with bathrooms for the children and future missionary guests. Pastor Vincent is the assistant pastor of Calvary Chapel Midigo. He is one of the few translators we have for teams and has a huge vision and influence for this area, his people, always finding inventive ways to spread the Gospel, enriching the community and sharing God’s love. He has a unique and loving way to share with the Muslims and his unsaved tribesmen including the Calvary Football (Soccer) Club, which are mostly Muslims. 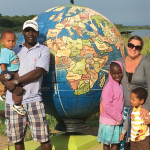 Melissa Aniku came to Uganda as a missionary in 2008. She is now a pastor’s wife and is accepted as part of the local tribe. She takes care of the children in their home (her Timothy’s). She is learning how to homeschool and do therapy for her son with ASD. Another main ministry is caring for the many daily guests that come to visit. Both Pastor Vincent and his wife Melissa are blessed with opportunities each day in a land where so many are crying out for the Savior. The harvest is truly plentiful!